When staff at the Mill Road Vet Clinic in Whangarei, New Zealand, arrived at work last week, there was a surprise waiting on their doorstep - a box of tiny, 3-week-old kittens. Clinic staff took in the kittens, but the next day, there was another unexpected visitor - the kittens' mom, who had tracked them down, was waiting by the front door. "We noticed a tabby cat hanging around our front door, trying to sneak in every time a client arrived. When we realised [the cat] wasn't going to go away, we picked her up and discovered she was a feeding Mum," the clinic posted on Facebook. 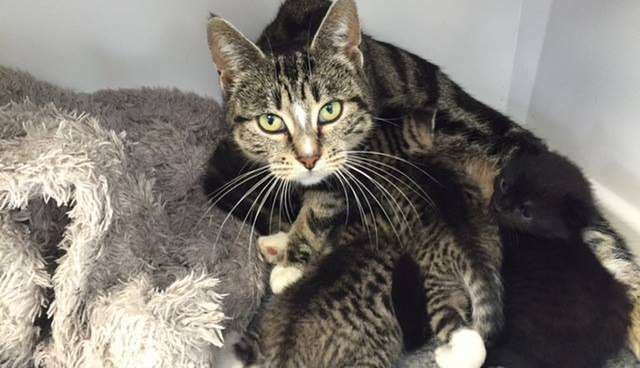 Staff members suspected the mother cat might be there for the "orphaned" kittens who'd been dropped off a day earlier, so the shelter brought her in to see them. It was instantly clear they were a family. The clinic now plans to care for all the kittens and their mom until they can find homes for the whole family. For now, the mama and her babies are happily reunited and getting the care they need.